The New Year is upon us offering a chance to reflect and make choices about the future. For the Vietnamese, the New Year is yet a few weeks away in a celebration they call The Tet Nguyen Dan, which most people referred to as Tet. I was lucky enough to find myself in Vietnam for the Tet festival in 2002, traveling from the northern part of Vietnam; I stopped in a city called Hoi An. As we enter into the hectic holiday season, with the store shelves filled with Christmas candy and decorations weeks before Thanksgiving, I am reminded of the Christmas I spent in Bangkok, where you had to look hard to find anything about Christmas. A sincere thank you to Ginger and Gail at the Blue Bottle for hosting my book signing and photo print sale. Another large cudo to Matt Harmon, my friend know as The Bald philanthropist, who wowed the audience with his musical talent. Here Don Bowen and Matt sing a duo for the crowd. What a special day in Omaha! It was touching to see so many parents in school with their children. A day was spent with the 7th grade middle school students in Fremont taking a wondrous journey around the world. 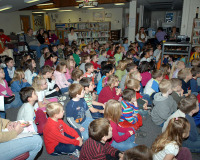 I had the wonderful opportunity to speak to every grade level at Howells Public School. No matter where we are on the journey of education, everyone is curious about the world we live in. Whether it's watching strange animals, observing foreign customs or respecting different religions, we all are a bit hungry to try and understand these experiences. It is my hope, that our day together in Howells has made room for some small insight, and wet the appetite to learn more! 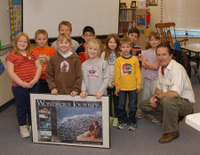 What a great group of students at Weber Elementary School in Iowa City, IA.